Why do dogs and cats fight? The internet is full of answers to this question but it is generally thought that they fight because both are predators. Another reason is that dogs are descended from wolves and are therefore pack animals whereas cats are solitary and will immediately take flight. 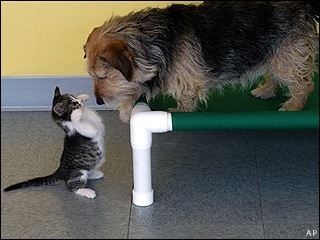 Not sure about that one as I have seen cats stand their ground In front of dogs (see above photo). Whatever the reason it takes me on to my next original art work. This is a limited edition print numbered 166/500, entitled Maxwell and signed by the artist, R. Samaraweera of Llanfyllin in Wales. 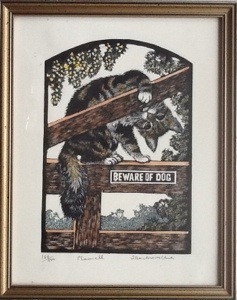 It is labelled “A hand painted limited edition wood block print individually engraved and printed by the artist”. It only cost £1 and similar works by this artist go for considerably more on various auction websites. Being a bit of a cat person myself I couldn’t resist re-homing this one.